How black is black? Sometimes a very deep dark black tattoo initially appears as though it’s resistant to PicoSure laser tattoo removal. However, we know what’s taking place on a microscopic level; ink particles are being shattered by the photomechanical PressureWave and removed by the body. So why does it sometimes initially look as though nothing is happening? Well we have to go back to my original question regarding just how black are some blacks. When we remove a layer of black ink we reveal the layers below which are obviously also black. Because the skin is translucent, meaning we can clearly see through it, the remaining layers of black ink are still highly visible. It’s sort of like an old printer running out of black toner; the words get lighter and lighter but we can still read them quite clearly. It may take 4 or 5 treatments before we see islands of clear skin within some of the blackest of tattoos. 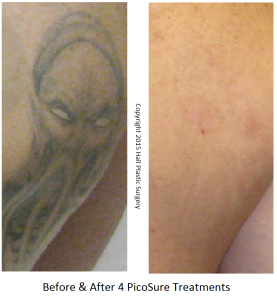 So what does all this mean to a PicoSure tattoo removal patient? We have to be patient on some tattoos and trust in the technology. Hopefully your provider is charging you a fair price and even though you may require a significant number of treatments to remove your coal-black tattoo it will still be affordable. Remain committed to your tattoo removal and you will be glad you did. 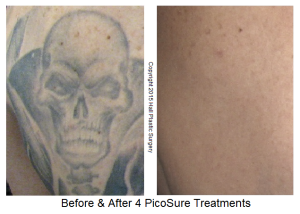 If you have a dark black tattoo that is heavily saturated with ink and you would like it safely and thoroughly removed with PicoSure, I can be reached by phone @ 512-479-9997 or just stop by my NEW location in Austin, TX: Austin Medspa on W. 6th St.